A foggy dawn would later be a nice day. Good Morning! Palazzo dei Consoli bright and early. 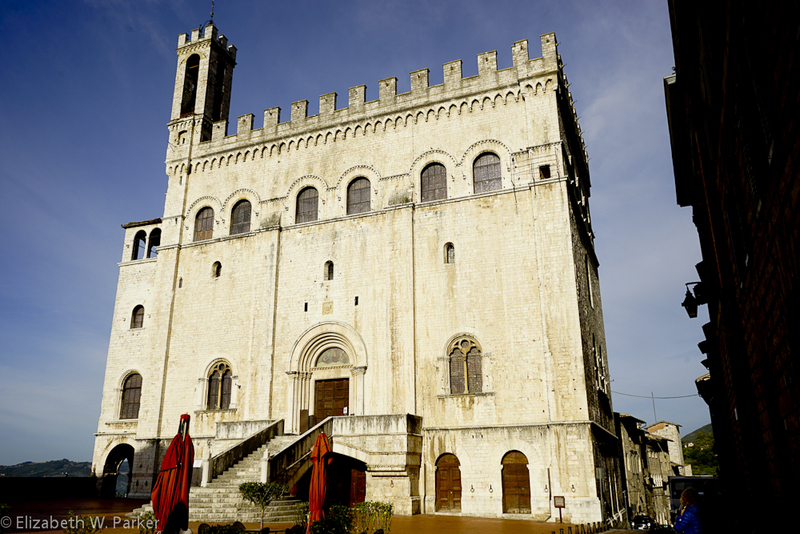 As I mentioned, we were staying in Gubbio for the first two nights of our walking tour. Here is a map, to give you an idea of what the city looks like and where some of the places I will mention are located. Our morning began with a drive to the top of the hill behind our hotel. The day was mostly sunny and comfortably cool. We walked companionably down the hill, winding our way through forest of hardwoods and pines. Views were not many at first, while we were in the thick trees, but eventually they stretch out to where we could see how the mountains are rather steeply conical, creating wonderful Vs through which we can espy distant vistas. The mountain is called Ingino and we passed a chapel and a country house along the way. Rather monumental for an out of the way town, no? Abruptly we were back in civilization, ending up at the town cemetery. Our vans transported us a short way to the base of a funicular…I guess that’s what you would call it! I had never seen one quite like this – Two of us got into each ”cage”, standing up and rode to the top of the mountain. The views were spectacular, once I got over the fright of the contraption and my general distrust of heights. Just one glimpse backwards toward the valley, and I forgot all my misgivings about the conveyance. Wow. What a view! The funicular deposited us where we had started earlier in the day, but now on the other side of the Basilica of Saint Ubaldo. 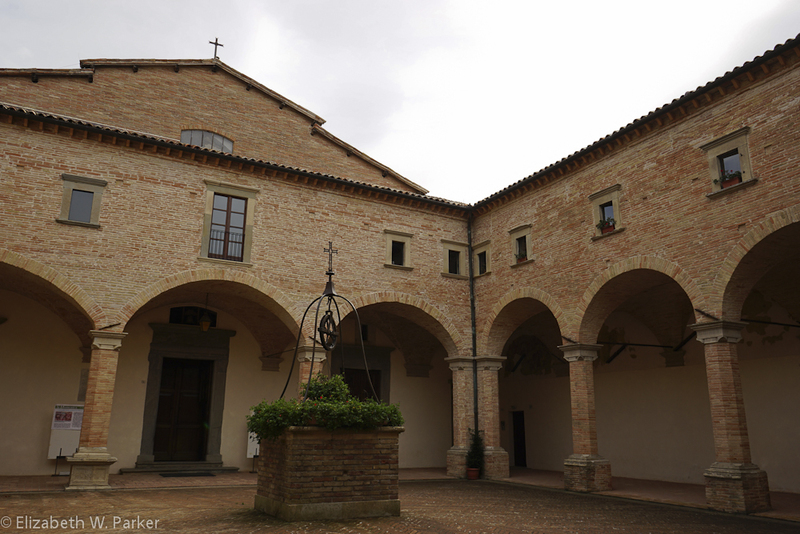 The Basilica is a lovely structure, made of pinky-orange brick, but the real marvels are inside: The body (yes!) of Saint Ubaldo himself, looking pretty black and leathery, but venerated nonetheless, a saint of peace. 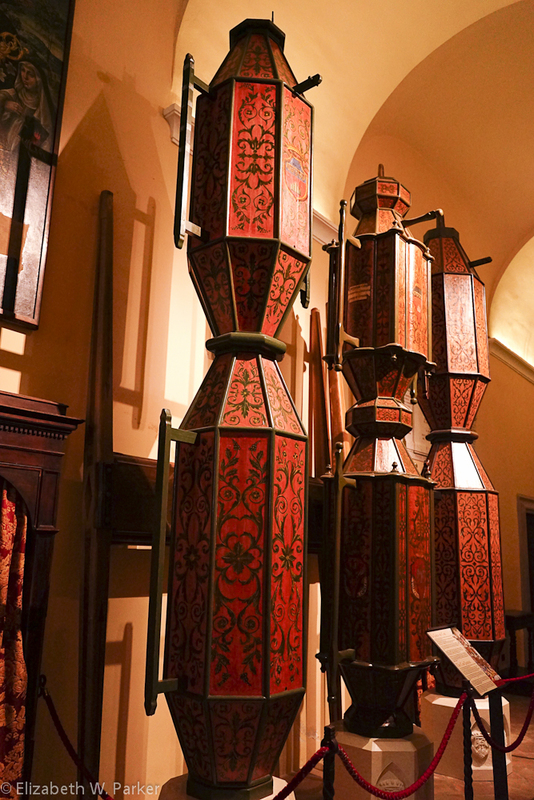 And the the bases of the famous “ceri” or candles (not sure where that part comes in today). 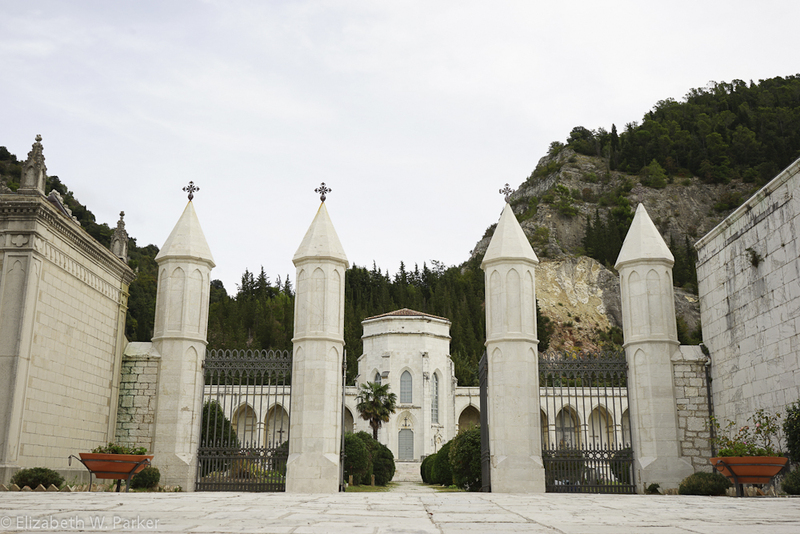 There is an annual festival in which the these “candles” are hoisted up by groups of men and raced up the mountain. After lunch we walked down the race way – shorter than our morning walk, but steep enough to make you wonder at the prowess of the young men who make it up the hill carrying the heavy ceri in 13 minutes!! The ceri bases seem to be made of wood and they are quite large. 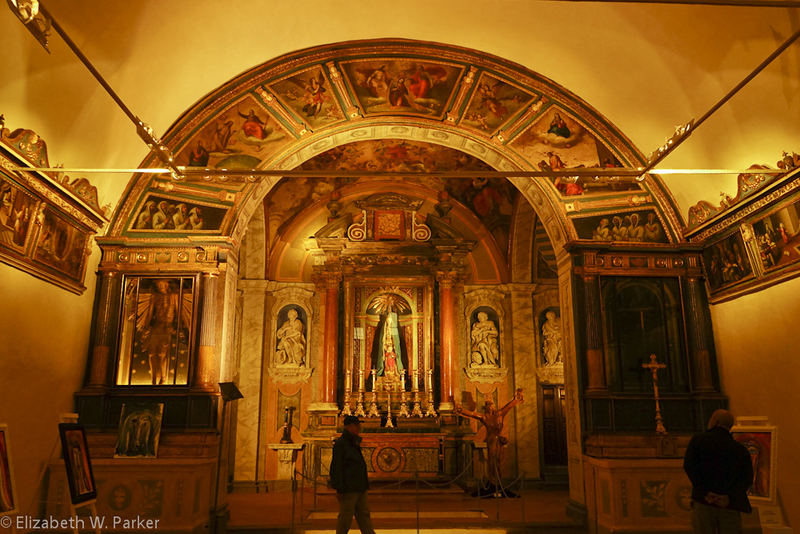 Each is topped by a statue of a saint (there statues are kept in a different church in town and we did not see them). The festival takes place in May. These are the bases of the ceri. I included this picture because here you can see what the race actually looks like. See the saint statues on the top and the men straining below? Click on the image to see it much larger. We had a great lunch at a restaurant called La Cia at the top of the hill. It was a very pretty place with views (though I had my back to them). I am beginning to see the pattern our meals will follow. Generous platters of cold cuts, and other hors d’ouevres circulate as the wine starts flowing, both red and white. We also order food, though usually just one dish, from either the first courses or the second courses on the menu. Portions are quite substantial so ordering both would be basically like putting yourself in a food coma! Then of course (!) there is dessert and coffee. There is nothing to be done but to walk after lunch, too! 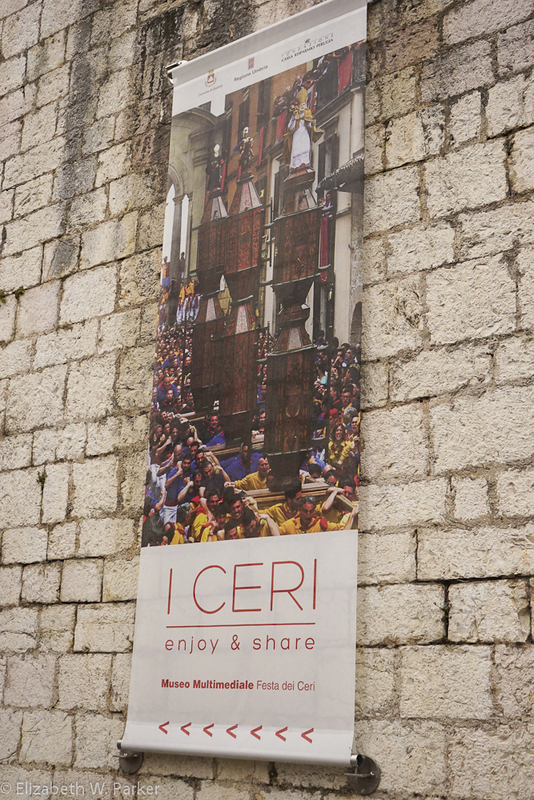 We walked down and back to town, as I said, along the road that teams race with the ceri in the May festival. We walked all the way back to the hotel. Coming from above, we walked into the tiniest square I have ever seen between two important buildings, anywhere! The buildings were the Duomo and the Palazzo Ducale (after which our hotel is named). We visited both structures and returned on our own to our hotel, via an elevator that took us down to the main square where the hotel has another entrance. With my free time, I went to visit the huge building flanking the main piazza, the Palazzo dei Consoli, which houses a museum filled with Roman remains from excavations as well as a pinoteca. 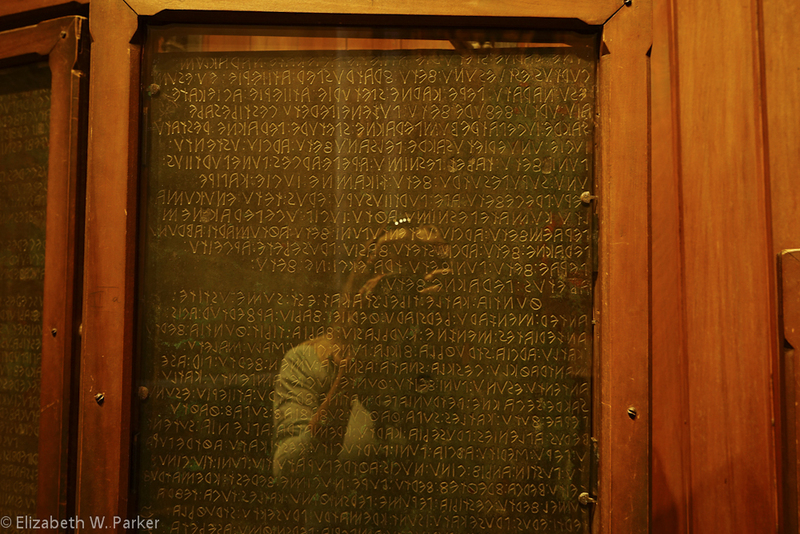 But the most interesting item in the museum is a series of tablets written in Umbrian, a language that pre-dates Etruscan, which of course you know is another people who inhabited Italy before the rise of Rome. They are called the Iguvine Tablets and they date from the 3rd century BCE to the 1st century AD. I was startled to see that the Umbrians used both the Latin characters we are familiar with and the Etruscan character to write the tablets. They describe religious rites and are really a significant archaeological find. This is a shot I took from the loggia way up on the Palazzo dei Consoli of the piazza below. 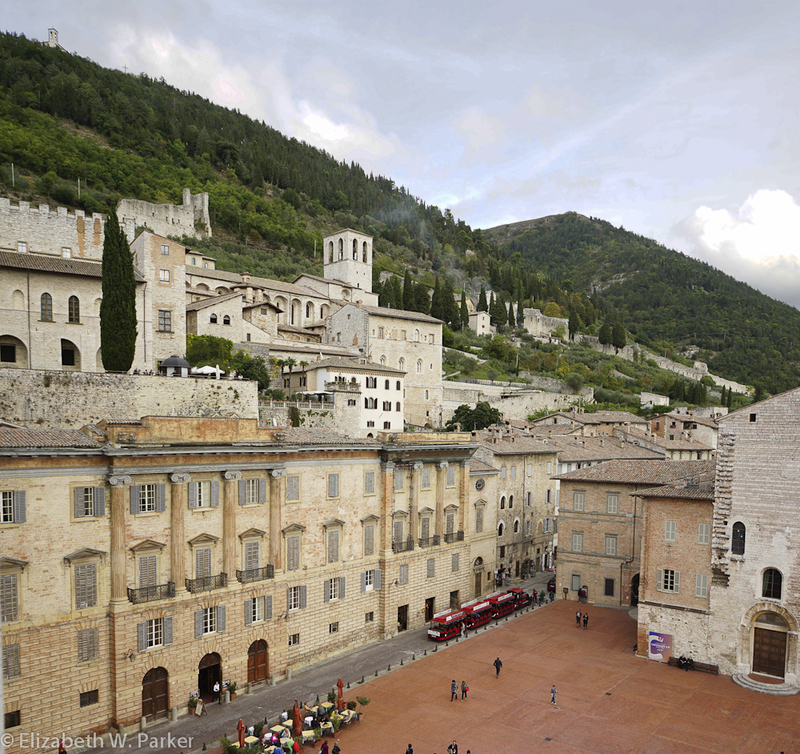 Note how Gubbio is built up the rising hill. Explains why their are elevators for short cuts from top to bottom! Ps our hotel entrance is the middle door of the three in the second building from the left at the level of the road. Here’s a selfie of me photographing the tables for you. Katia Baldelli and her father are part of an artisan movement in Gubbio to create ceramics using the ancient techniques and glaze recipes. Her presentation to us was most interesting and we were able to see lots of samples, large and small. We were also able to purchase, but not using credit cards, so I came away empty handed. Her shop is just a short walk down from our hotel (but is not the first one you would see walking along that street.) 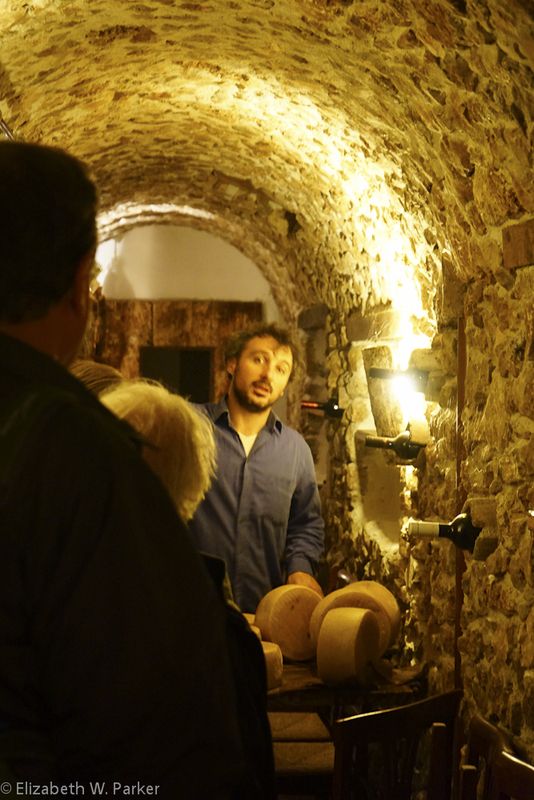 Here is a link to a general page about Gubbio, with a couple of paragraphs about Mastro Giorgio. 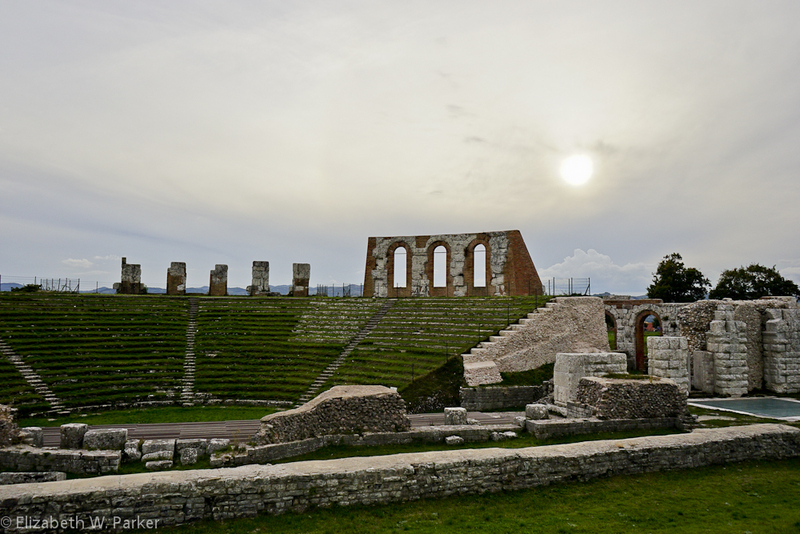 The remains of the Roman theater at Gubbio. The final excursion for the day was a walk to see the Roman theater remains. Clearly visible from the piazza in front of the Palazzo de Consoli, the walk was very easy and took us through the town. It was fun to walk along those old streets and see the life of an Italian Friday evening. We stopped in at this church on our way back to the hotel from the Roman theater. It was quite unusual to me – all the decoration was on painted wood. That night, we visited another local restaurant for dinner (Ristorante Ulisses & Letizia) and tumbled into bed, deliciously tired! One of our fearless leaders, Donna, accompanies us in the Perugina factory. We were up and out of the hotel, bags and people in the vans around 9:30. The day is rainy as the weather report predicted. 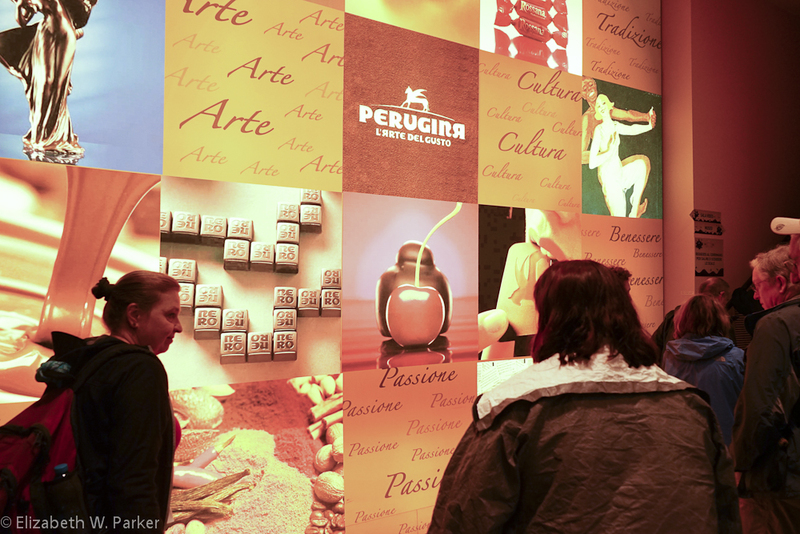 Fortunately, we are flexible and instead of walking in the rain we will walk to the aroma of chocolate: We’re going to the Perugina factory to learn how to make kisses. 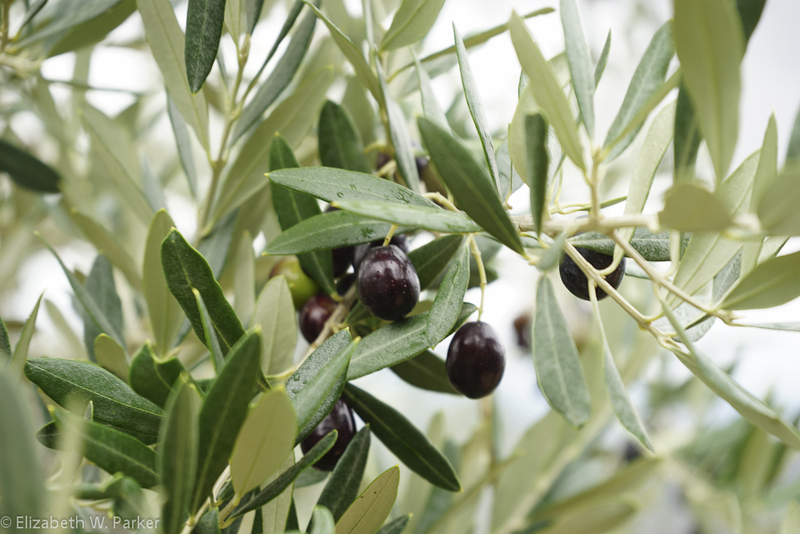 The factory, I think you could guess, is located in Perugia, about a 45-50 minute drive. Checked in, we proceeded to join our tour group. Unfortunately, ours is not a private tour, or rather it is a private tour with 30 other people, none of whom speaks English like the guide assigned to us. They brought their own translator though so the result, what portion of the tour we could actually hear, is in both English and some eastern European language. I had no idea cocoa grew like this. That big pod with the seeds inside is longer than my hand. 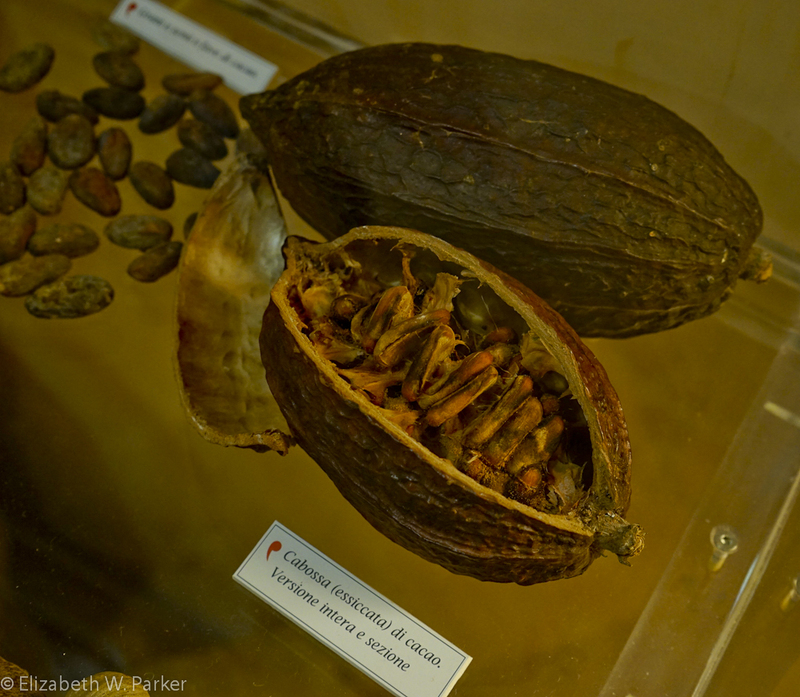 No matter – we read our way through the exhibits, learning about how chocolate is made, starting from the big pod. 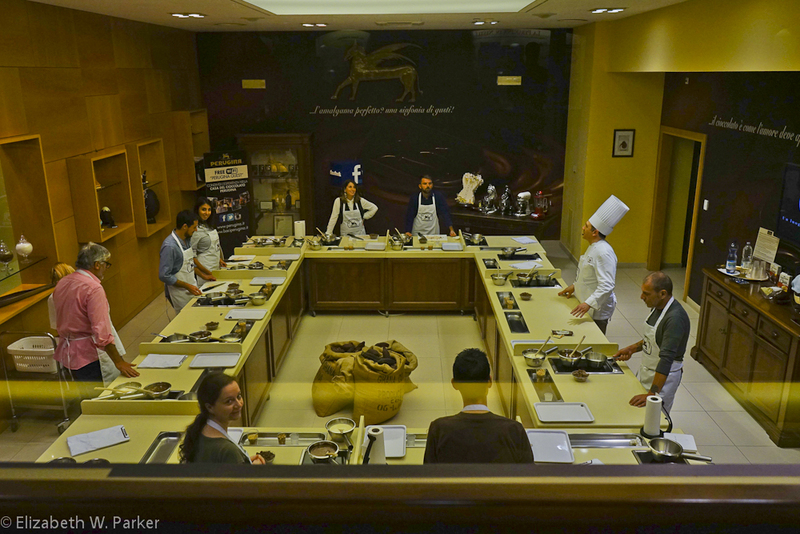 The tour includes a “tasting,” an event that does not entail any of the images of savoring delicious varieties of chocolate that I guess are running through your mind. With all those people, plus 14 of us, it was a shoving free for all, very reminiscent in my mind of trying to get onto a public bus back in the late 70s when I lived in Rome. Not very pleasant, but in those days there was a certain amount of “fanny pinching” that fortunately or not, I can no longer dream of eliciting! Here’s a class that might be fun! The woman looking at us is thrilled! 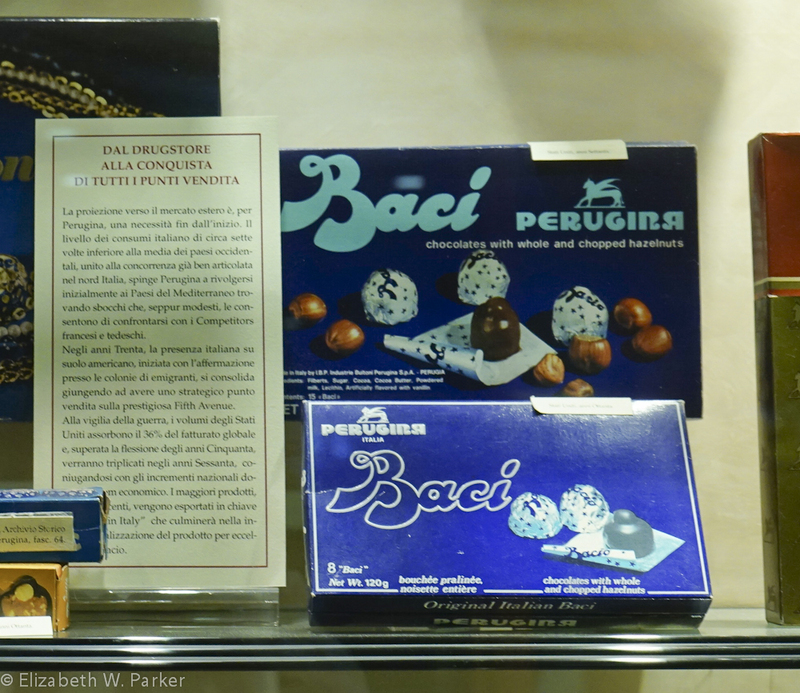 Best fun was walking through a Saturday-empty factory and discovering at the end a working line where kisses, Baci, were being packaged. We got to see how the kisses were first sorted to remove those that were imperfectly wrapped, then forced into neat rows of little “soldiers” who were then plucked from the masses by robotic arms and dropped into their paper boxes. The boxes were first manually checked to make sure the correct number were therein, then wrapped in plastic. Then the box was wrapped in what would be folded to be a paper sleeve and sealed. Last along the boxing line, each package was weighed, and underweight boxes were rejected. View from our lunch restaurant. Up on top of a windy hill on a cold day. Inside we found a warm, wood fire! Once we had finished the tour, the place was packed. Apparently this is a good activity for locals on a rainy Saturday, too. 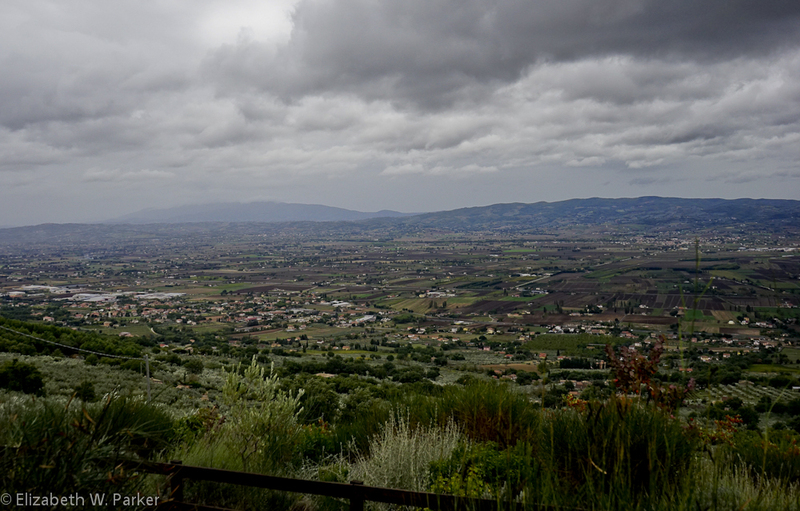 We loaded back into our vehicles and were headed to see an olive oil processing venture, but there were a couple of missed calls and connections and we ended up going straight to our country lunch high up on a windy mountain overlooking the wide, checkered valley. The restaurant is part of an agriturismo (working farm-based bed and breakfast) called Le Mandrie di San Pablo on the outskirts of Assisi.We came in out of the cold and the wind to a warm, wood fire and a hearty lunch of simple but delicious fare: Eggs with truffles (it is truffle season and we have had some variation of this dish at every meal), home-made prosciutto, tagliatelli with vegetables, ravioli with spinach and home-made ricotta with a truffle sauce, rabbit and roast lamb, tiramisu and fresh ricotta and lemon cake for dessert. Unfortunately, I got a migraine headache during lunch and so opted to go to the hotel and lie down rather than do the afternoon walk in the rain. Our new hotel, for the next two nights is the La Bastiglia in Spello. 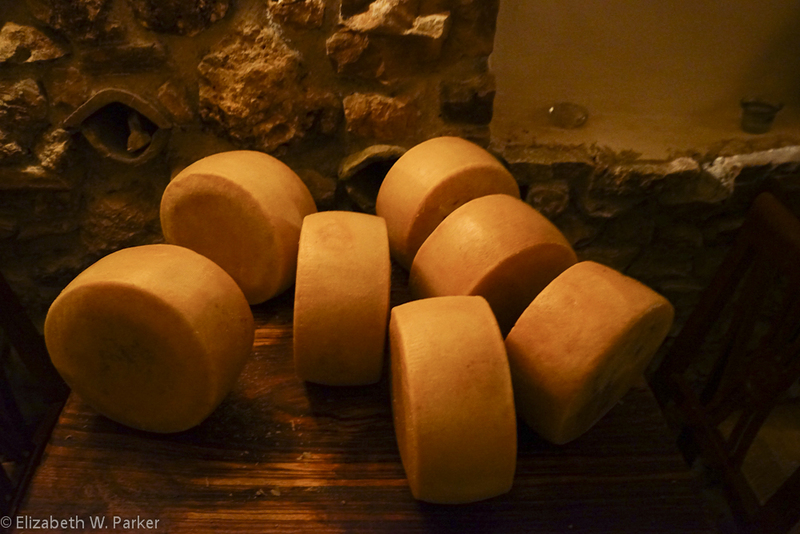 The owner of Le Mandrie di San Pablo makes cheese as well as olive oil.